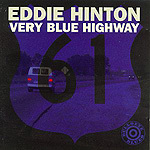 CD review: "Very Blue Highway"
A superb songwriter, stupendous guitarist and excellent singer, Eddie Hinton is one of the most undeservedly unknown Southern soul/R&B artists on the scene. Hinton is no newcomer; he's played with everybody from Otis Redding to Duane Allman through the years. His songs have been covered by everyone from Aretha Franklin to ska popsters UB40. On his latest release, his second for Bullseye, his songwriting, singing and guitar work are still at the top of their form. Twelve of the baker's dozen tunes here are Hinton originals; at least a handful are destined to become standards. If not strictly blues, Hinton's work  especially his guitar  is heavily blues influenced, and his stellar songs are bound to be appreciated by any fan of good music.